An Excess Of Daring? Or Hubris? It was 68 years ago that “Operation Market Garden,” the Western Allies’ attempt at a decisive blow to defeat the demoralized Germans on the Western Front, was acknowledged to have been failure. On 26 September 1944, after tens of thousands of troops had been deployed in history’s largest-ever airborne operation, with thousands of allied troops were dropped many miles deep into German-held territory, the operation was cancelled and such troops as could effectively withdraw were given the order to do so. Of the more than 10,000 allied airborne troops committed for ten days to this massive aerial invasion of the town of Arnhem in the Netherlands, fewer than 3,000 were able to make their way back to the safety of allied lines, with the remainder being killed or captured. After the unparalleled and unexpectedly one-sided success of the D-Day invasion of Normandy, allied planners were convinced that their experience and expertise in aerial invasion could be used to leapfrog the plodding pace of traditional infantry ground maneuvers to take the fighting right to Germany’s Western doorstep. Planning began in July of 1944 as the allies started to drive the German Army from Normandy and central France. U.S. General Dwight Eisenhower was in overall command of the European Theater of Operations, but Britain’s Field Marshall Montgomery was the allied commander of the forces that had come ashore in D-Day and its aftermath. Eisenhower was inclined to be cautious, preferring the steady land-based attack that had been employed from D+1, whereas “Monty” argued that a massive, unexpected aerial invasion behind German lines would instill panic and confusion among the German forces, while cutting their supply lines and communications, thereby permitting the allies to drive rapidly on to Berlin and effect a German surrender. Eisenhower had not only the obligation to oversee the military aspects of the European campaign, he also had to ensure that the political realities of the Western Alliance were carefully considered as well. Monty was among the most capable field commanders in Europe and he was Britain’s foremost General, a true national hero. It is also true that Montgomery had an ego to match his fame and acclaim, and that he was inclined to plan brilliant “master strokes” rather than to employ traditional methods and strategies. Though he and Eisenhower differed fundamentally on the advisability of “Market Garden,” Eisenhower finally decided to compromise, approving Montgomery’s plan. Eisenhower reasoned that the capture of the Rhine Bridges that Montgomery envisioned for his quick stab into the heart of Germany would also prove useful for allied capture of Germany’s industrial heart in the Ruhr and Saar valleys. The planning for D-Day had occupied more than a year, but Montgomery was so certain that the allies could leverage that experience that he allotted less than 7 weeks to plan and arrange the logistics of “Market Garden.” To many of the planners involved, it was clear that the time scale did not allow for the detailed “what-if” analyses that had been conducted during the planning for D-Day. It was also unclear whether or not the allies forces could provide all of the needed materiél and logistical support for a sustained operation. Operation Market Garden was notably lacking in contingency plans: it was entirely dependent upon a precise and unvarying time-table. But it was abundantly clear that the initial aerial invasion could be accomplished. Despite the planning, Market Garden was a complete disaster. The time-table could not be followed. Key bridges remained in German hands, and the Germans responded in far greater force than the allied planners had projected. The troops who had parachuted behind German lines were cut off and surrounded. Indeed, far from everything going according to plan, it was very nearly true that nothing went according to plan. In the end, thousands were lost to no avail. In retrospect, one overwhelming question has always stood out: why did the planners ignore the problems inherent in planning an invasion with little or no contingency planning? Why were the many manifest and evident problems not pointed out and explored? Why was a rush-job allowed? How was Market Garden given the go-ahead when its planning required that all details work as planned at all points? Cornelius Ryan explored these questions in his classic account of Market Garden, A Bridge Too Far, (1974.) The reasons were many and varied as might be expected, but Ryan concludes that the most crucial failure in the entire planning process was the failure to consider “negative opinions.” The high-level planners were so intent that Market Garden be a smashing success that they did not want to take the time to listen to the possible problems and difficulties that might be present. In very short order, it became unacceptable to point out oversights and omissions, and those who tried to do so were asked to leave the planning team. Even minor, low-level staffers were pressured to omit any planning that considered the possibility of failure at any level. In 1977, Ryan’s book was made into an epic film of the same title. Sir Richard Attenborough’s masterful film is faithful to the book and is as fine a piece of historical film-making as one is likely ever to see. One will likely never see so many stars in one film again. With a huge cast that included a pantheon of Hollywood greats, and gargantuan special effects and recreations, the movie itself was an almost perfect case of “Group Think” as well. Though several market analyses indicated that the American public was not terribly interested in war films in the mid 1970s, the studio decided to forge ahead making what was at that time the single most expensive film to date. Operation Market Garden did not fail for lack of qualified, capable, and valorous troops: the men who fought in the operation were as brave and as skilled as any soldiers who fought in World War II. The failure was top-down. When the planners stopped listening to contrary opinions, or to possible problems, branding those who raised the issues as “negative,” or “not team players,” they failed the “team” as a whole. It would take more than valor, more than skill, for a plan such as Market Garden to have worked. It required perfection. And so the plan was doomed from the start, doomed by the mere fact that so many people so desperately wanted it to succeed. Today the University of California Golden Bears meet the Ohio State University Buckeyes on the gridiron in Columbus, Ohio. The football teams have no especial rivalry, though they have met a few times in the past century, but there is an old and deep connection between the two schools’ marching bands. To a significant degree, the Cal Band as we have known it over these past six-plus decades is a direct result of one meeting between the Cal Band and the OSUMB. More than sixty years ago Cal met Ohio State in the 1950 Rose Bowl game, playing to a capacity crowd of 100,963. Because January 1st fell on a Sunday in 1950, the contest was held on Monday the 2nd. There is a four-page photo spread of the bowl game in the 1950 Blue And Gold. One cannot help but notice that the one picture of halftime shows a precise, high-stepping Buckeye Band. The Cal Band is nowhere in evidence. Compounding the frustration of the gridiron defeat, Cal also came up a distant second in the match up of the two school’s marching bands. So striking was the contrast between the high energy and flashy performance of the Ohio State Marching Band and the rather visually unremarkable and incomprehensible production by the Cal Band that something of a minor scandal erupted. A veritable storm erupted in the California press. Even the mild-mannered Blue And Gold staff could not but damn the Band with faint praise; in the 1950 Blue And Gold, the caption writer for the Cal Band’s page could only say that the Band was “perhaps at its best for rallies,” and also mentioned that the uniforms that year (the infamous “mustard-yellow pants” uniforms) were “bad.”  Criticism was everywhere, and it persisted. In the wake of the controversy generated by the Cal Band’s showing, several changes were instituted. Was this simply partisan hyperbole? Evidently not. In this day and age where band’s seldom garner much attention from the news media, it is literally astonishing to read how much ink was spilled over this issue, and how widely. “The demonstration of band superiority Ohio State gave was more convincing than in football superiority. In Ohio last week we were told that Ohio State’s band was the best in the Big Ten, and we will believe what we have seen. The fancy stepping has to be perfect, for white shoes below black pants would make any mistake stand out. One of our informants says the reason the band is so good is that – practice is mandatory. A man can elect to play in the band instead of drilling in the R.O.T.C., we – are told, but he must put in the same number of hours weekly. And won’t somebody please ask the Cal bandleaders to change their uniforms? They look like street cleaners. In an especially acidulous editorial the week after the game, The Daily Californian deplored the Cal Band’s showing and called for changes to be made immediately. This editorial famously quoted University of California President Robert Gordon Sproul (Horn, `09; DM, `11) as saying, “That band smells,”  which was just the sort of “sound bite” that was destined to be repeated across the country over the next several days, and repeated it was. Of course, there were those who did not feel that the Cal Band deserved to be attacked so vigorously. On January 11th, one opinion piece in the Tribune asserted: “Aspersions cast upon the University of California band don’t bother us for we still think the band is great and always was. If it doesn’t strut with the best of strutters, what of it? All we ask of the band is that it hide in the tunnel out at Memorial Stadium for a while and then, at exactly the right moment, come roaring out with that “Tum, tum, tum for California” song. That always makes us choke and feel as if we were 40 years younger!” And the editorial summed up this point of view with, “As for bands that perform maneuvers and do a lot of fancy steps, well, we always say that if a ballet comes to town we can stay away from it and it’s the same with a band.”  And yet, this apparently positive opinion seems pregnant with ironic criticism. After Dr. Cushing stepped down, the ASUC asked the music Department to provide a new director for the Cal Band. James Berdahl (StuD `37; Director `50-`71) was asked to fill the post on a temporary basis while a permanent director was sought. (On the Berkeley campus, it seems, “temporary” means a couple of decades at least) With James Berdahl at the helm, things began to turn around for the Cal Band. It was not an instantaneous process, and it took immense amounts of effort from scores of people. The change came not as a top-down, officially imposed overhaul, but came from the Cal Band members themselves. Ultimately the process required several years. Yet this controversial episode was indeed one of the crucial pivot-points in the history of the Cal Band. Yet other folks close to the actual events, including many long-time Cal Band supporters, echo the more “canonical” assessment. In another interview, former ASUC Executve Dirctor Forrest Tregea (served 1959 – 1968) stated “The Band had poor performances in 3 consecutive [Rose Bowls. ]”  However well the Cal Band may have performed musically, the preponderance of opinion was that things had to improve. And with James Berdahl as acting director, things began to get better. “AT BERKELEY this Christmas Day resides a man to whom such a fate should never have happened. I can see him now — quivering with the shakes, worried by fear of the unknown, now knowing whether Michigan will spring the two-platoon or two-bassoon system against his forces come New Year’s Day — a man bedeviled by alumni pressure, California’s band director, James E. Berdahl. Remember his predecessor, Charles Cushing? Professor Cushing’s team, you may recall, was outmanned, outfought, outmarched and out-maneuvered by such a considerable margin in the main side-show at the last Rose Bowl game (by Ohio State, to Jog your mental processes) that the guy gave up the ghost and quit. As we now know, the Cal Band *did* improve dramatically, so that by 1958 the Band was invited by the State Department as a representative of the United States at the World’s Fair in Brussels. And the Band’s performance at the halftime of the 1959 Rose Bowl was widely acclaimed for its creativity — A huge rose was formed by coordinating the Band with the card stunts — its musicality, and its remarkable marching precision — the show opened with a marquee that displayed the game’s current score! The change had not happened overnight, and so many people put in so much effort to make it so that it is not possible even to begin to give them adequate recognition here. All the same, such recognition is indeed due. We have an organization which can rightly be called “The Pride Of California” because many committed people worked hard to make it so and to keep it so. There is one aspect of this whole story that has stood out with striking clarity in my mind from the very first day I joined the Cal Band: we who were prospective incoming Band members were told this part of Cal Band history on our very first day in the Band! During the evening of Sunday, 11 September 1977, a brief history of the Band was presented by a couple of Band Alumni. No “warts” were skipped. We learned that President Sproul had declared “That band smells.” And we learned that committed people with vision and determination had learned from the experience and had risen above a less-than-stellar past. I remember thinking at that time how unusual it was for an organization to hold up its past for clear examination. It is still rare for any organization to acknowledge past foibles or mistakes. I have always admired an organization which can forthrightly and honestly examine its past, and pay proper attention to both its brightest days and its darker hours, giving each subject its due. I honestly believe what this plain and honest approach taught me has been of consistent and applicable value in my day-to-day dealings ever since. dant cuneum densaque ad muros mole feruntur. The band are keen; they form a wedge; they march. This article in The Daily Californian is referenced in at least a dozen contemporary news articles in papers from both California and Ohio, and the Sproul quote is included. I cannot locate the original article, however. Some claim that Sproul never said this and that The Daily Californian had misquoted him. Sproul himself later said “I never said I hated the Band. I hate those mustard pants!” That seems to me like “spin,” though, as it deflects rather than addresses the original quote. NB: Cal Band members have never received academic credit for any Cal Band activities; the Cal Band remains a student musical activity and membership is on a wholly voluntary basis. NB: The Ohio State University Marching Band is not now nor has it ever been student run, though the students are directly involved with that Band’s operations and organization as band staff members. It is well worth reading the column in its entirety. Though today the 11th of September is now most widely known as the anniversary of a gruesome and senseless act of monstrous terrorism, I would like to recall a more personal anniversary that is far more positive and pleasant. It was thirty-five years ago now – Sunday 11 September 1977 – that the Cal Band’s “Class of `77″, as we of the University of California Marching Band style these things, started its first Fall Training Program, better known as “FTP.” This is not truly the day when we joined the Band – that lay a few days in the future after we had passed the audition process – but it was our first day with the Cal Band. With nearly sixty anxious recruits, the class of `77 was quite a large intake of potential new band members. By the end of FTP there were 53 freshly minted Cal Band members who participated in the traditional Silent Walk, which concludes the formal induction of new Cal Band members. The numbers are significant, for the Cal Band had 127 members during the 1977 season. I do not know the statistics, but I would think that there has rarely been a class of new members who comprised such a large percentage of the Band (42%.) A large percentage of the Class of `77 stayed on through the next four years to receive their prized Cal Band Blankets. Many years ago I wrote down some recollections from that first FTP I attended. Some old memories fade, but that week of FTP is still clear in my mind. It is no exaggeration at all for me to describe the experience as “life changing.” I arrived at FTP that Sunday morning a very different person from the one who attended Silent Walk seven days later. My first hurdle was the music audition. Boy, was I nervous! I had been travelling for almost the entire summer and had not touched my horn in about twelve weeks. I flew from LAX to Oakland early on Sunday the 11th of September, the morning that FTP started. This was the first trip that I had ever made alone in my entire eighteen years — in fact, I had never even been in an airplane until three months earlier. I had to make my own way to the dorms where we stayed for FTP (due to the fact that BART did not run on Sundays at that time.) I took a cab and was scandalized at the cost. If memory serves, it came to a whopping $12.00 with tip.) But the driver had been extremely pleasant on the trip, and told me tales of students he had met, mentioned that “the Band up at Berkeley was pretty sharp,” and wished me luck. He also turned off the meter at Channing Circle, despite having two more blocks to drive. I felt that things were off to an auspicious start. Once I arrived at Deutsch Hall in Unit One where registration was taking place, I was directed to get a horn from the Room Q coordinator — for some reason I seem to recall that Larry Espinosa (Clarinet, `74) was involved — and report to auditions. “What good will that do?” I demanded. Scotty was then called in for his audition, and I grew more and more nervous as I listened. By the time Scotty came out, giving me a thumbs-up gesture, I was a basket case; I was dry-mouthed, shaking, and tongue-tied. Mr. Briggs, the director, invited me to sit down. The first thing he noticed was that my knees were bouncing up and down like springs. He astutely surmised that I was quite nervous, and he spent a few minutes asking about my summer and such small talk in an effort to get me to relax. I honestly cannot recall just what the audition consisted of. After Mr. Briggs handed me some music my mind is a blank until he finished and told me that “because I want us to march ten basses” the band needed me. I have always thought that smacked of squeaking by, and I wonder whether he saw beyond my wretched audition to perceive a greater ability or if he simply was desperate. Later that evening he told me that he was confident that I would be up to snuff by the end of the week. Whatever the case, I think that it must have been a truly terrible audition, and so those details have mercifully faded from my mind. I honestly had no idea of just what I was getting myself into. After the audition I had to check in to my dorm room. I was rooming with Dave Lowrey (bass, `76) who was the bass section Teaching Assistant (TA) for the Fall of 1977. Naturally this added somewhat to my apprehension, but Dave was friendly — if somewhat brusque — and I figured it would work out fine. Dave poked his head into the room long enough to introduce himself and then turned to speak with some other TA. At that point and at others that morning the conversation was peppered with “colorful” adjectives. It struck me at the time — though it seems quite silly now — just how much vulgar language was being used in casual conversation; I recall wondering if I really was suited for such a crowd. Of course, sad to say, I soon acclimated. The coarse language was simply one of those “college things,” I guess, and it really wasn’t all that terrible by today’s standards. At the New Men’s meeting we were told some basics about the Band and its policies, the rehearsal commitment, and its high standards. Then they played a film of some pregame performances and halftime shows from previous seasons. Watching these remarkable displays of marching prowess and musical mastery, I suddenly felt very uncertain about my future. I had assumed that marching would be a piece of cake compared to the music audition, most of the college marching bands with which I was familiar performed drills that were, essentially, the same things we did in high school, albeit on a far grander scale. But here I saw a Band of unbelievable, extraordinary speed and skill, playing and marching in drills and routines so complex that it seemed to me it would take months to master any one of them! I was unable to see how I could ever learn to march like that, and certainly not inside of a single week. I was not the only one who was in awe by any means. I think just about the entire crop of New Men were thunderstruck. After about forty minutes we broke for lunch. I recollect that despite the best efforts of the “Old Men” to mingle, the table I was seated at was composed entirely of New Men. I sat across from Barbara Holliman (mellophone, `77) who was wearing a T-shirt that said “Cello Power.” I was impressed by her confidence that we’d all be able to manage to march like pros by the end of the week. You see, the end of the week was hugely important, as we had been amply made aware, because the first pregame show and halftime performance (not to mention post-game, which was charted way back then!) were to be the following Saturday for the Cal vs. Air Force game. Thus we did not merely have to survive FTP, we had to succeed. The point had also been stressed that the pregame block would be just 92 bandsmen, and so competition for a place in the block would be intense. In fact, that block size greatly influenced that entire Fall season as we’ll see later. That rehearsal started one of the most intense and demanding three days of my life. I do not mean simply the intensity of FTP which was certainly present throughout that week. Rather I mean the intensity of realizing that one has a personal challenge to face. That first rehearsal was tough, both physically and mentally demanding, and personally nerve-wracking because I had never been very agile or particularly well coordinated. I was not then (and I never really have been) a “quick study” when it comes to choreography and the like. Yet the Cal Band was teaching marching fundamentals that demanded both physical exertion and rapid mastery. We started with one of the Cal Band’s most distinctive marching basics, “high step,” so called because, as the name implies, it involves a crisp, high lift of feet with a rather challenging “toe-point.” When it is properly executed, it looks deceptively simple, but to leg muscles unused to its requirements, it is a truly demanding first step. High step would be used through most of our pregame performance. We also learned a variant of high step that was suited to slower pieces which demanded a more stately effect. This fundamental was called “show high.” We would be using this toward the conclusion of our pregame show as we marched to America The Beautiful in the “full field spread,” as the band expanded across the whole of the football gridiron. Show high required raising your feet so that your thighs were parallel to the ground. Because it was a slower maneuver, it seemed at first to be relatively easy. But legs unused to these fundamentals quickly found the slow and stately pace was actually more ache inducing than high step! The final marching fundamental I recall learning that afternoon was a “back pivot,” a 180-degree reversing step. I watched so carefully, but could not seem to get it right. As I mentioned, I was definitely growing worried, especially because it had been made clear that we had more – much more – to cover in the next two days. By the time 5:00 rolled around, I was tired and frustrated and more than a little scared. Tired because of a three-hour workout in the warm autumn sunshine, frustrated because I was not picking up the fundamentals rapidly, and scared because I was afraid I would fail to pass the marching audition. Suddenly, even after just one day, I wanted to be in the Cal Band more than I had ever wanted anything in my life. And I knew that it would require more hard work and dedication than anything that I had ever previously been involved in. I still look back on that Sunday afternoon, walking back to Unit One (a pretty long hike, so plenty of time for reflection,) and I can vividly recall resolving that I would make it. I said to myself that no matter how much work it took, I was going to be a part of the Cal Band and I would learn my fundamentals. I do not know if I then realized it, but it certainly is the Band’s emphasis on its carefully crafted marching fundamentals that made it possible to take a batch of raw recruits and turn them into reasonable marchers inside of five days. And since everything builds from the fundamentals, those amazingly complex drills do become learnable. But whether or not I understood the long-range benefits of the fundamentals, I knew that I had to get them down. And I clearly recall resolving to make it. I really think that this was the first time in my life that I had so clearly aimed at a goal which was — to me at that time — so uncertain. I grew. When I got back to Deutsch Hall, I found that my sister Anne was waiting for me. She was driving from central Washington down to Southern California, and she stopped to have dinner with me. We ate at the Round Table Pizza on University Avenue, and she dropped me back at the dorm just in time to make the evening music rehearsal. The music rehearsal was held in the Cal Band’s Band Rehearsal Hall, which, given the Cal Band’s propensity to reduce every term to its initials, has always been better-known as BRH. It seemed an incredibly large and fancy facility to me in those days. Its multi-tiered layout was perfect for a 120-piece ensemble. The walls were decorated with the annual formal group photos of the Band, which imparted a sense of the long history and tradition we hoped to soon become a part of. The hall had been cleaned up and readied for FTP, so the clutter and detritus that accumulates over a Fall season was not yet visible. Music rehearsal was another intense experience, of course. It seemed that none of the Old Men needed music even though we played for three hours! I was once more unsure that I could ever get to that stage, but as I said, I made up my mind that it must be possible. By the end of the rehearsal my lips were painfully “buzzed,” but I was having a great time playing my horn again. I also liked the fact that we sang as well as played, for I have always loved to sing. We learned the words to the music we would be playing for the pregame show, and to the campus alma mater, All Hail. I recall thinking at the time that in four years of high school band I had never properly learned the words to our high school alma mater, yet here, in one evening, I had learned half a dozen school songs. It was an impressive experience. I also greatly appreciate the fact that Mr. Briggs gave a short history of each of the songs we were learning. The University of California has a rich treasure trove of school songs, generally simply referred to as Cal Songs, and we had just begun to scratch the surface; throughout the season, we would continue to learn other songs from the abundant resource of Cal Songs, including some truly obscure items. As I learned of this musical heritage which even then spanned almost nine decades, I realized that this was an organization with a long and cherished history. That appealed to me powerfully: to be a part of a tradition that spanned nearly a century! That was a fine prospect indeed. I walked back to Unit One with Dave Lowrey, Kip Parent, (bass `75) and two other New Men, Dan Blick, (bass, `77) and Carlos De Los Rios, (bass `77.) Despite the alleged 11:15 lights out, all of the New Men seemed to be up for hours “kicking the walls” to practice high step. I remember being aware that my legs were already quite stiff. What a week lay ahead! Monday morning 12 September 1977 was one of the most unsettling moments of my life! As I mentioned, I was rooming with Dave Lowrey, the bass’s TA. Dave had brought a huge and noisy box-fan into the dorm room, and despite my assurance to Dave that I could sleep through anything, the damned fan kept me awake most of that night! The fan was not merely loud, it was in pain! It seemed to be out of balance so that it developed an unpredictable but irritating screeching noise at odd intervals. Whir, whir, whir, whir, screeeeeeeeeeck, whir whir whir… As the week wore on I did manage to sleep through the cacophony — exhaustion is a wonderful sleep aid, after all — but I got little rest that first night. And, for reasons that I have never understood, when the TA’s came to our floor to do the dreaded reveille — rattling door knobs, pounding on doors, and generally making enough noise to wake the dead — they skipped Dave’s and my room! Yes, much to my consternation and fright, Dave and I slept till about ten minutes of nine! The second field rehearsal was starting in ten minutes! I woke up Dave and we dressed in a fury and ran down to the field. As we passed through the great green gates to Edwards Field, Dave instructed me to walk, as running would call attention to us. I didn’t bother to ask how two guys walking across the field with sousaphones could fail to attract attention, but I walked. I had visions of being drummed out right then and there, since punctuality had been stressed as being especially important for the week, but thankfully no one really seemed to notice, and we were just a few minutes late. In reflection, I would imagine that our tardiness had indeed been duly noted and that Dave, as a TA, was probably dressed down right smartly by the Drum Major (Bob Smith, clarinet `74.) But since I was a tyro, they did not make mention of it to me. I was grateful for that, for sure! A real down side for me was that I not only had missed breakfast — no big deal — but I had missed the chance to make a bag lunch for the day. By the time dinner rolled around that night I was starving, but I survived. The morning started off with a review of the previous day’s fundamentals, and the introduction of others. That afternoon we began learning some of the basics of the pregame flows, and each section would march a drill playing its part. It was wonderfully weird to hear a group of mellos, say, just punching out off-beats of Big C and marching down the field. At music rehearsal that evening we began learning some of the halftime music which was various selections from Star Wars. I was mightily impressed that the Band could get the music from a movie that was still in the theaters! This was definitely a far, far cry from high school! We had quite a lot of music to learn that week. Pregame consisted of Big C, Sons of California, California Indian Song, Fight for California, America The Beautiful, and The Star Spangled Banner. Post-game included Make Way For The Bear, Fight `Em, Stanfurd Jonah, Lights Out, One More River, and By The Old Pacific’s Rolling Waters. The halftime was various pieces of thematic music for a Star Wars show, but also included the theme from Star Trek, (the TV show; at that time there had been no movie versions!) and, interestingly enough, the theme from the Underdog cartoons. This volume of music was, too, a far cry from high school days. Tuesday morning started off much better than Monday. Dave and I woke up and had breakfast and arrived on the field in plenty of time. On the way from the dorms, Dave insisted that I stop to buy a pair of gym shorts. I had marched the previous two days in blue jeans, and Dave wisely and correctly felt that shorts would be better. I also bought a bottle of Block Out sunscreen and some chapstick. The marching drills were getting more complex and demanding, and the weather was warming up. The dreaded marching audition was a day and a half away. Those of us not used to spending more than eight hours a day in the sun were already beginning to show the effects: chapped lips and sunburn were pandemic. I recollect that on that second full day I finally began truly making friends and acquaintances. By some unspoken sense, we New Men had begun to feel that we as a collective group were going to succeed. I know that this memory must be tinted by the reflection of the following years, for our class — despite fierce differences at many points — was definitely characterized by a collective sense of support and stick-to-it-iveness. Yet I remember people both on the field and off insisting that we were all going to make it. I know that some did not, and I admit I have no memory of those people now, but those of us who did make it were many. And in large measure we made it because of the mutual support. Certainly Old Men were encouraging, but it was from the New Men that the most insistent support arose. In the bass section we had a good number of New Men: Dan Blick, Carlos De Los Rios, Ken Needham, (bass, `77) Dave Reyna, (bass, `77) and me. There were also five Old Men, Jay Huxman, (bass, `76) Kip Parent, Randy Parent, Greg Schoofs, (bass, `77) and Dave Lowrey. So we newbies were one half of this highly visible and musically important section. (Mr. Briggs was very big on the importance of the basses.) We knew that we were both crucial and untrained, and we worked intensely that night to master highstep and kicking the walls. I remember all of us New Men basses being up until at least two o’clock working on this. I also recollect that Ken Needham was among the most fanatical among us, not merely driving himself, but pushing the rest of us too. As I say, we seemed to have quickly developed a sense that we were a team, and we were a team that would succeed. That sense lasted us through the next four or five years, and is one of my most treasured “possessions” from my Cal Band days. Wednesday’s rehearsal began with Drum Major Bob Smith pointing out that the prominent concrete C on the hillside east of campus had been desecrated; it had been painted (a rather wimpy shade of) red! Horrors! Not, I think, that any of us, New Men or Old, had any doubts that this was an inside job, but we were all duly horrified. And I believe that we New Men also understood that it portended some certain obligation on our part. In fact, it was probably mentioned to us that it would be our duty to repaint it, though I am not certain. That day’s rehearsal seemed to go on and on and on and on. Well, the time of the marching audition eventually arrived. With the passing of years it seems that this was held very late in the afternoon with long golden shadows stretching across the bleachers of Edwards, but in reality it took place between 4:00 and 5:30, so it cannot have been quite so picturesque. Yet it ought to have been at least that visually dramatic, for it was that emotionally dramatic. For those who have never experienced FTP, the significance of this test cannot be completely understood. It is not merely a test, it is a goal that has loomed large for three previous days, and given the intensity of an FTP experience — no phones, no TV, no newspapers — it becomes the only thing. It is huge, intimidating, and necessary. Every bandmember, new or old, must march 100 yards with a TA at every ten-yard line recording your effort. The marching was done to a bass and snare drum, (Karl Bizjak and the percussion TA, Tom Blair [percussion, `76]) snapping out a cadence that echoed and reechoed off the surrounds like gunshots. In some ways it felt more like a march to an execution than a march to an achievement. Scary. Scary. But it had to be done. “Who’s there?” comes the loud response. Then the whole crew would join in singing Fight For California, which opens with the lyrics, “Our sturdy golden bear is watching from the skies.” Of course the words “Our sturdy” are formed from “Oyster:” “Oyster dee golden bear …” It is, obviously, incredibly silly and lighthearted. Yet the forced levity could not mask the fact that after that evening some folks would be gone, and some would remain. And we were all on tenterhooks. There are those who think that it must have been obvious that the Band would accept all whom it could, but consider this: we knew that the basic block had been decided at less than 100 people, and that the pool of people at FTP was more than 130! We did not have the confidence that the Band could even afford, whether or not desiring, to bring so many New Men aboard. We were scared. Monica Johnstone, (clarinet, `77) summed it up best when she said to a gathering of New Men, “those of us who don’t make it now will come back for re-auditions next week.” For Monica, as for the rest of us who stuck it out, failure was simply no longer an option. I do not mean that we were cocky; I mean to say we were already a committed group. Once we arrived at the huge concrete initial which adorns our rugged eastern foothills, sensory overload set it. Virtually all of the Old Men were there exhorting and demanding, hollering and screaming, hurling foul epithets, and in general encouraging us Freshmen to paint the C! Large buckets of watery yellow (gold?) paint had been provided, and stubby brooms and worn-out mops were handed to us. If you have ever tried to accomplish anything with 60 people screaming at you and jostling, and hassling you, you are well aware that it can be a challenge to say the very least. Add to that background the hopelessly inadequate tools that we were given, and you can imagine there was much room for less than positive critiques of our work. Nevertheless, after a surprisingly short number of minutes — yet still an eternally long passage of time, relatively speaking — the defiled C had been restored to its rightful hue. And then, as suddenly as a thunderclap, silence reigned. What followed was something of an epiphany for me personally, as I was really not too impressed with the hazing part, though I feel that I took it in stride. The reason what followed was such a revelation was that there was suddenly a genuine sense of belonging imparted to those of us who had just survived three and a half tough days and ten minutes of hell. We were accepted into the fold. Cal songs were sung, bawdy chants and cheers were hollered, tales of dubious authenticity and questionable moral value were related. I’ll not go into more detail, though the night is still a vivid memory, because much of the subsequent couple of hours just would not be fitting for the written record. But suffice it to say that when I returned to the dorms that night, I felt that I had indeed been accepted by the Cal Band. On Thursday we began working on the halftime in earnest. It was really quite a relief after the previous few days, because the halftime show was necessarily kept to a simplified minimum. That is to say, simplified in Cal Band terms. There was a good deal of stand-and-play rather than intense marching drills, and the show was a props extravaganza based upon Star Wars, which was the mega-hit blockbuster of the summer of 1977. We all appreciated the comparative simplicity of the halftime show because we also had a huge amount of work yet to do on pregame. The pregame that season was charted for 92 bandmembers (actually, in a bit of unusual subterfuge, the charters had inserted four additional marchers into the flow after the script Cal and before the long lines of America The Beautiful so that the full field spread would work properly. As I have mentioned earlier, this small block size gave rise to a fairly intense competition among bandmembers, since we had ended up with 127 people after Wednesday evenings cuts. The pregame started, of course, with Big C and a flying wedge which would burst out of Memorial Stadium’s North Tunnel at impressive speed. We then transitioned into Sons Of California and a block C, then into California Indian Song and concentric squares. From there we naturally played Fight For California as we formed the traditional script Cal. We jogged off and formed the long lines for America and the full field spread, and concluded with our national anthem. A fairly typical pregame, to be sure, but also a fairly demanding one. We managed a full run-through by late Thursday so that Friday was spent polishing pregame, working on halftime, and learning postgame. Postgame was not terribly demanding when considered in light of that pregame and halftime, yet it was a charted performance with a block and some pretty complicated flows. But by the end of the week we had gotten a firm enough grasp of our fundamentals that it seemed almost “easy.” We New Men, and myself in particular, had come a long, long way from that Sunday morning just five days and half a lifetime before. I went to sleep that night anxiously and eagerly awaiting my first Cal Band Saturday morning. I will never forget was my very first marching performance with the Cal Band. It was Saturday September 17, 1977. Though it was more than half my lifetime ago, it is a vivid and clear in my mind as if it were last week. And how could it be otherwise? Though we newly created band members had been in the Band just six days, we felt as if we had been focussed on this goal for months. Cal was to play Air Force that day. It was not then and is not now a major Cal rivalry, and the attendance at the games was expected to be quite low, somewhere between 20,000 and 25,000 fans. But for those of us who had never performed in Memorial Stadium, the prospect of thousands of people watching us from the seats was fairly impressive. We had done our final rehearsal of Friday in the great, empty stadium, and it seemed unimaginably vast. I think that I expected twenty or thirty thousand people would nearly fill the place up! In any case, it would surely be the largest crowd I had ever performed before, and that was exciting. And a wee bit scary. So it seems to me that every new Band member was both eager and anxious for Game Day to begin. Saturday morning arrived with a bang at 6:30 as the T.A. squad went from floor to floor rousing every one. We had to get an especially early start that morning because in addition to the logistical hassle that a Band Saturday morning usually is, we were also checking out of the dorms and other such mundane triviata. Bags were packed, gear was gathered, and everyone’s goods were piled into a large room on the ground floor of Deutsch Hall to be collected after the game was over. Keys were turned in and names were checked off the lists. In remarkably short order, the checkout process was wrapped up. Breakfast was light that morning. I recall that it consisted of a selection of those tiny boxes of cold cereals, tiny cartons of milk, and tiny cartons of orange juice. Many of us did not want to risk eating anything at all. There was fear of developing cramps and such, but I think more than that was simple newbie jitters. I recall Gerri Rosen (piccolo, `77) advising people to drink the orange juice, though. The fluid and the nutrition would come in handy. It was a busy morning. We walked from Deutsch to BRH where we changed into the standard Saturday Morning Uniform — pants, white shirts, hats, and rehearsal vests — and many folks enjoyed coffee and donuts which were in those days provided by the Band for each Saturday rehearsal. For those of us in the Bass section, this would be our first rehearsal using the “performance horns,” which were King, satin silver sousaphones, with gold-plated bell interiors. The King sousaphones had been purchased for the Bicentennial Tour two years earlier. These were striking horns, and they were kept in nearly flawless condition. For daily rehearsal we used the older Besson sousaphones. These were heavier than the Kings, so it was a nice break to use a lighter horn on game day. The basses walked down to Edwards, footsore and weary after a week of FTP, I would guess, but no one mentioned anything. The excitement was palpable. Saturday morning rehearsal started at 8:30 sharp, and lasted for two hours. We ran pregame first. That year our tunnel formation lined up in the north end of the track field (naturally!) where there were textured steel plates covering some pits. The steel plates were thick and painted an ochre red, inappropriately enough. When someone jumped up and down on them, they made a jangling, clashing din of cacophony. And jump up and down one person in particular did. After running through pregame full-out, we ran halftime. As I mentioned earlier, the show took its theme from the smash hit of that summer, Star Wars. Due to the tight schedule of FTP that year, the show was planned as a melodrama with plenty of acting and dancing and such, but relatively minimal marching and maneuvering for most of the Band. It was also a prop extravaganza. A golf cart was pressed into service as a sort of shuttle craft for Luke Skywalker and his Wookie sidekick (Jim Hutcherson, [trumpet, `75] and John Soper [trumpet, `75].) Jim was resplendent in his Skywalker whites, and Soper was looking vaguely ridiculous in a hilariously furry, black gorilla suit. The golf cart itself sported shiny, aerodynamic-looking, cardboard-and-aluminum-foil side panels. Exhaust was simulated with a dry-chemical fire extinguisher. I was impressed by the quality and complexity of these props. Tom Blair was AdmProp (Assistant Drum Major for props) that Fall. He and his crew had built a huge box that would be placed in the middle of the halftime formation midway through the show. This not only would serve as the platform for dancers and for Luke Skywalker’s fight with Darth Vader, it also served as concealment for the various costumed characters who were part of the show; Doug Kern (trombone, `75) played Darth Vader in an enormously over-sized, papier-mâché helmet, Carol Dows (tenor sax, `75) took the role of Princess Leia, complete with prominent buns in her hair. I will never forget the surreal sense of the absurd I felt when it came time for the platform to be placed on the marching field. From the drum major’s tower, Bob Smith instructed – as if it were as normal a command as any he’d given that morning – “Prop, hup on three!” The actors inside the giant box simply carried it onto the field, supporting it from the inside. After some last minute refinements to the halftime show we did one run-through of Post Game, then it was back to the Band Area for lunch. I was so impressed that the Band provided sandwiches for everyone on Game Day. It was now 11:00 and we had an hour to eat and change before the Band’s concert on the steps of Sproul Hall on the east side of Sproul Plaza which traditionally signaled the commencement of Game Day festivities on the Berkeley campus. The Sproul Steps concert would be followed by a sort of parade through campus, with the Band leading a stream of Cal Fans up to California Memorial Stadium. We in the bass section were told to be quick because we also had to align the bells of our horns before we hit the steps. It may sound like a simple procedure, but it required that everyone be present and ready so that the alignment would be as uniform as possible. It was fortunate that the ASUC Store had a large expanse of plate-glass windows which we used as a sort of mirror to help us get the adjustments right. About 11:40 the Band began to form up on lower Sproul Plaza. Shouts of “I’m excited!” echoed off the concrete walls. “I’m excited!” was an understatement. I was excited, undeniably, but I was also nervous as all get out. Would I mess something up? Would I get to my spot in the wedge in time? Would I be able to play all the music? And on and on. I guess I could say that I had butterflies in my stomach. But they were enormous, paper-kite-sized butterflies. I was eagerly looking forward to that afternoon. This would be the first time I had ever been to a college football game, as well as being my first Cal Band performance, and I could look forward to performing for my older brother Bill and my twin brother, Rob (trombone, `78.) My brothers were driving from Southern California that morning with various goods and items that I had not packed for FTP, but which I would need for the coming quarter. After attending the game in Berkeley they’d be on their way to take Rob at U.C. Davis where he was enrolled that Fall. “No, Berkeley PD!! !” as we passed a Berkeley city officer. Once we reached Memorial Stadium, we bass players had to change from our street shoes into the soccer cleats needed for strutting on the grass of the football field. The cleats had all been put in a large box that was driven up to the stadium in the “Band Van.” As we all retrieved our cleats I was panicked to discover that I had only a right shoe! My other cleat was not in the box!!! Naturally I had visions of trying to strut in black dress shoes and falling flat on my back in front of 20,000 fans. I was quite distressed, particularly because I was absolutely certain that both cleats had been together (tied together, in fact) when we put them in the box. I was at a loss for what to do – there would not be time to go back to BRH to look – when Jay Huxman saved the day. He had had the intelligent (and probably obvious) notion to look in the back of the Band Van! The missing cleat was found and I would be able to march. As the time to form up approached, I was growing more and more nervous, and getting that adrenaline rush that anyone who has ever stormed forth from North Tunnel can readily recall. (To this day when I listen to any recording of the Tunnel Yell, I still experience a trace of that feeling.) There were Band members throughout the tunnel stretching and limbering up and generally getting ready for the surge of energy needed for tunnel flow. “Tunnel flow” is conducted with the vast majority of the Band executing a double-quick step that is nearer to a flat-out running pace than a marching step, and truly requires proper warm-up. The basses, however, bring up the rear of the wedge by strutting out of the tunnel at a pace of six strides per five yards, an impressive feat that demands a degree of physical fitness above and beyond ordinary marching maneuvers. So North Tunnel was filled with bandmembers in an array of bizarre postures, readying their limbs for the upcoming task. Suddenly the tunnel grew quiet and the cry of “Stick’s up!” announced that the time had come. “Pick up your heels! Turn your corners square! And TWINKLE! TWINKLE!! TWINKLE!! !” (You must remember that I was in the bass section. The vast majority of the Band booms out the more understandable, “DRIVE! DRIVE!! DRIVE!! !” The basses technique of flashing our bells as we marched was termed “twinkling,” hence the basses’ alternative wording.) As I say, the adrenaline surge that hit when tunnel cadence began was almost overwhelming. As the band exploded out of the tunnel, the basses remained along the walls on each side until we could form our lines for the entry strut. I was the second from the end in the right-hand line. Greg Schoofs was behind me. Despite the electricity of the moment Greg was cool, calm, and collected, and he politely pointed out that I was out of step as we jogged our tunnel pace in place. I felt painfully embarrassed, naturally, but at least I was corrected before we actually started moving. As the last of the ranks took off, we basses charged down the tunnel and flew across the grass, strutting into our positions at the back of the wedge. Though the stadium was indeed far from full, all the same the crowd noise was unlike anything I’d ever experienced to that time. Nothing like the U$¢ game later that Fall, nor Big Game, when Memorial Stadium was filled to capacity, but still, for someone who had only ever performed for high school football games it was more fuel to that rush. Pregame was a blast! By the time we finished the ripple bow which concludes the traditional script Cal, there was a tangible sense of having accomplished a truly great goal. The fans were applauding and cheering for us. I was astonished and proud to hear the rooting section bellow out: “Cal Band GREAT!! !” What a wonderful feeling! We then moved into the long lines in position for the full field spread in which the Band would be distributed across the entire football field, endzone to endzone and sideline to sideline. Because of the relatively small size of the Block that Fall, the spread was even more widely spaced than usual, and I was very anxious that I might miscount and miss my pivot, but Dave Lowrey was near me in the north half of the field as well, and he helpfully yelled at me “NOW!” So I did it right. After we jogged off the field we took our place in the stands. It was always nice to be in the bass section at the far back of the Band, because we had a really good view of the field from about 20 rows up. The game was not terribly exciting; Cal was dominating Air Force from the get-go. I began to yawn and I was sorely tempted to nod off. The Fall afternoon was warm and pleasant, and sleep had been a scarce commodity that week. When halftime arrived, we formed up to go onto the field. Because Air Force had not brought their band, we were treated to an exhibition of falconry as Air Force’s halftime contribution. It was an impressive display, and those of us along the sideline had an excellent view. But I would guess that the folks in the stands found it hard to see much of anything. In 2004 at the Cal/Air Force game, I was intrigued to discover that they still had a trained falcon exhibition, but I did find it awfully difficult to see that falcon against the background of a stadium crowd. As I said above, the halftime show was somewhat complex logistically, but it was nowhere near as demanding as pregame. We started off with the theme from Star Trek, with our piccolo section filling in for the TV music’s theramin. OOooeeeeee-dee-dee-dee-dee-dee … Albert Locher, (trumpet, `68) the Band’s announcer, intoned the familiar, “Space. The Final Frontier …” The first formation was the outline of the starship Enterprise. We then morphed into the setting for the Cal Band’s rendition of Mos Eisley spaceport and cantina. Dancers came forth from the prop which had indeed duly hupped on three to arrive in position on time. Our version of the cantina’s mixture of freakish aliens looked more like bumble bees from Romper Room, but the effect worked. I thought this was way neat: the bass section represented “The Force.” We surrounded the evil Darth Vader and symbolically smothered him with our bells! Goodness triumphed, evil was thwarted, and we wrapped it all up with John William’s “Graduation Music” from the film. Huzzah! It was truly a simple show by Cal Band standards, but it was effective and the crowd loved it. The Stunt Comm that year had shown sound judgment in creating a halftime show that could be learned along side a pregame and a postgame all in one week. Cal’s lead at halftime was maintained throughout the second half, and when the final seconds ticked off the clock, it was California 24, Air Force 14. What a great bit of good fortune. The Class of `77’s very first game was a Cal victory! As we formed up in the south endzone for postgame, I was still buzzing from the adrenaline rush. We played Palms Of Victory and All Hail and many fans lingered on the field listening to our postgame concert. In those days, the fans always took to the field after the game was over, and so our contact with our audience was quite direct. At last it was time to march back to the Band Area. We formed a block to leave the stadium to “One More River.” The Band that marched off the field that afternoon represented a truly magnificent accomplishment: Fifty-three raw recruits had presented themselves at FTP Sunday morning six days and a lifetime before. The people who left Memorial that afternoon were indeed the Cal Band, an integrated whole, a new chapter in a long and proud tradition. Such an accomplishment was possible for many reasons. I think that the determination of everyone involved was important. But all that determination would have come to naught if it were not for the Band’s long experience in training new recruits, the development and teaching of fundamentals, building upon years of previous experience, improving where needed, and retaining what worked. Above all, the Band’s sense of its heritage and commitment that was so fully conveyed during the days of FTP was key. All of these things combined to channel the enthusiasm and determination of the new members into the polished product that is the Cal Band. In late September of 2005, I was teaching a class in Dallas. After the class ended on Friday afternoon, I was talking with one of my students, and I discovered that he had graduated from Cal last year. We spoke about the coming football season, and he mentioned that he’d been there for the dismal 2002 season. Though I had not yet told him I had been in the Cal Band, he offered: “That year the only reason anyone came to the games was to watch the Band!” I felt quite proud that such a statement could still be made. The Cal Band is a heritage worth maintaining, and it is an asset to the University. We marched down to BRH following the reverse of our route up to the stadium. As we passed in front of Doe Library, Kip Parent introduced us new men basses to an odd tradition: we picked up our horns in our left hands and carried them raised above our heads until we passed from the front of South Hall. It looked a bit strange, I would guess, and frankly, after the week we had experienced, it felt terrible! But in its own way it did look fairly impressive. My arm was really burning by the time we got to put the horns back on our shoulders. 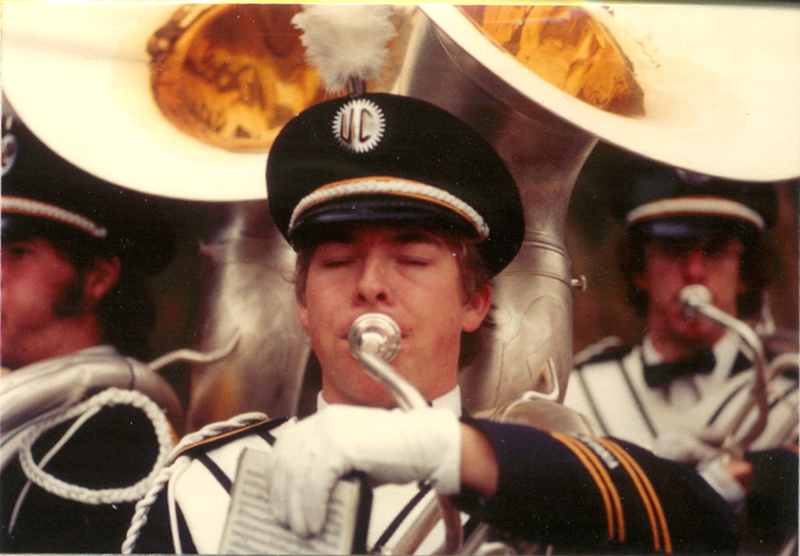 Detail of a shot of Cal Band Basses beneath Sather Gate after the Cal v Oregon State game, October 1980. Left to right: Joel Buringrud, Jamie Rawson, Alan Barton. My brothers Rob and Bill met up with us as we passed under Sather Gate, and I gave them directions to Tellefsen Hall, the house on the north side of campus where 44 male members of the Band would live that school year, so they could take my gear up. Bill told me that he had seen the Cal Band many times (Bill was, alas, a benighted UCLA alumn) and had always been impressed by the halftime shows. He told me about a show at UCLA in the early `70s where the band had done a dance in the darkened L. A. Coliseum using flashlights. He said the Cal Band was a top-notch group, and he was pleased and proud that I had made it. Me too! When we arrived at BRH there was much rushing and hurrying, because that evening would be a ceremony called “Silent Walk.” We had to change, get our gear, head home to change into dressy clothes, and be back at the Band Area at 7:00. Some expressed a concern that we might be in for another “Big C” type ritual, but Ken Needham rightly pointed out that they wouldn’t ask us to dress up for something like that. Silent Walk was a moving experience. We were charged with the responsibility of remaining silent so that we could listen, absorb, and contemplate what we were to learn. We walked in silence through the campus, stopping at various significant sites to listen to a presentation about some aspect of our Band and our campus. The silence gave the event a feeling of deep solemnity and importance, and the ritual seemed nearly religious in its bearing. In the coppery light early evening, amid the long, tangential shadows, the campus was a beautiful setting for the Walk. Later that evening I found out that Rob had walked back to the Band Area after we had set forth on Silent Walk to look for me. Norman Chong (baritone, `74) was waiting on the bridge for any late Silent Walk participants. He saw Rob dressed in blue jeans and a casual shirt and said, “Jamie! You’re supposed to be dressed up!” He later admitted that it took him a couple of minutes to believe that Rob really was my twin brother! We ended the Walk inside California Memorial Stadium where the scoreboards were still lighted up, displaying the score from the afternoon. The Walk, though not so very lengthy, had been quite a lesson. The things we learned gave us a sense that we had become a part of something far greater than the sum of its individual components. We learned about a time when the president of the University had declared the Band “a disgrace,” and about the evolution of the Cal Band that became the Band which has for more than sixty years been an undeniable source of pride for the University and its community. The Walk concluded with the bestowal of Cal Band pins upon the new Band members. Dave Lowrey pinned mine on me. I cannot recall having been so proud of any recognition in my life. I had made it, and I was a Cal Bandsman. Rarely have I ever had such a sense of rightness and fittingness. I was where I was meant to be. There have been many attempts to explain the widespread popular appeal of Star Trek. Explanations range from the humorous and fanciful to the serious and academic. Part of the appeal may have been the great variety within the show’s frame. The original series avoided formulaic stagnation by its wide range of episode styles. The show included episodes that were dramatic and serious, such as the much acclaimed City On The Edge Of Forever, to the farcically funny Trouble With Tribbles. I have always favored the explanation offered by Rosalind Harper, my high school Latin teacher. She noted that Star Trek offered a view of humanity that was consistently hopeful and positive at a time when television and movies were growing increasingly grim and cynical as the traumas of the 1960s rent the nation. As epitomized by Captain Kirk’s famous, “I will not kill – today!” the show offered a perspective that acknowledged mankind’s brutal potential, but which tempered it with civilized restraint. Add to that way-cool technological fantasies such as hand-held computerized communication devices and the as-yet-unrealized transporter, Star Trek provided relief from the realities of the daily headlines of the era. For whatever reason, Star Trek remains a vivid presence in our contemporary culture, and with a new generation of young actors portraying Kirk, and Spock, and company, it seems likely to remain so for a very long time.